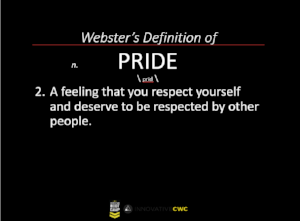 Of all of the Belief Deceptions that Christian Boot Camp teaches on, by far, PRIDE is the deadliest. It will destroy your relationships with people, cause God to turn against you, and will actually unify you with satan. You can always tell when someone is overly-consumed with self because of the frequency of their use of personal pronouns, such as I, me, my, I'll, mine, myself, I'm, etc. (One of CBC's class exercises is to tell students that their homework for the week is to eliminate the use of these personal pronouns for a full week, so that students will become aware of how often they refer to self during conversations). EMBARRASSMENT – Think about it: why do you get embarrassed? 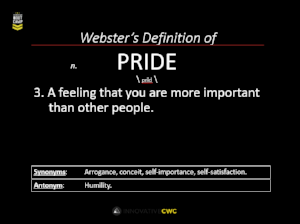 It’s because you’re worried about what others will think of you (PRIDE). STAGE FRIGHT – How is stage fright PRIDE? Because, just like embarrassment, you’re overly worried about what others will think of you. ALWAYS LOSING YOUR CAR KEYS – We all know someone who does this. How is this PRIDE? Because instead of putting their keys where they should go, they put them down somewhere else, thinking “I’ll remember where I put them when I need them again.” And guess what, they weren’t able to remember (overestimating their recall abilities). Some translations say, “God opposes the PROUD…” Another says, “God actively opposes the PROUD…” The original Greek word that was translated to “Resists” or “Opposes” is Antitassetai, which has a much stronger meaning than the translation. It means that God Sets Himself against, or Takes a Military Position Against. So when we act in PRIDE, God actually takes a military position against us. That’s a pretty scary thought. Satan, by his mere nature, is (always) against us. If you struggle with PRIDE, get alone with the Holy Spirit. Confess where you’ve been prideful and wrong. Repent (turn) from PRIDE, and ask Him to help you. He will, because He loves and cares for you, and doesn't want to oppose you, but wants to help you.